See available Amadeo Gennarelli sculptures for sale at Mark Murray Gallery. We specialize in buying & selling 19th Century & Impressionist art. Amadeo Gennarelli was born in Naples, and while he was initially a pupil of Francesco Jerace (1853–1937), he emigrated to Paris in 1913. Until about 1930, Gennarelli exhibited regularly at Paris salons with the Société des Artistes Français. 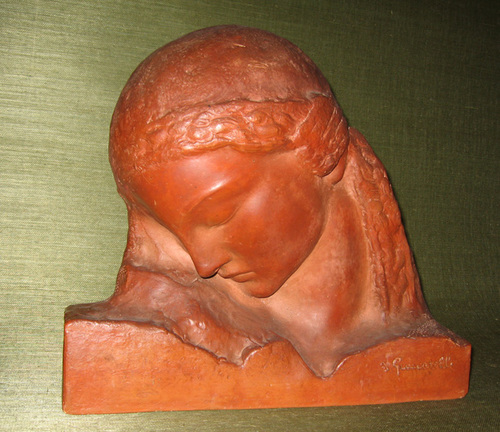 He is best known for his art deco sculptures in bronze, terra cotta, and wood, though he also worked in decorative arts. His work was most centrally focused on allegorical subjects, figures, mythological figures, female nudes, and urban landscapes. Currently there are no available Amadeo Gennarelli sculptures for sale at the Mark Murray Gallery. Please contact us if you are interested in selling your Amadeo Gennarelli sculptures or other artwork from the 19th century and early 20th century.